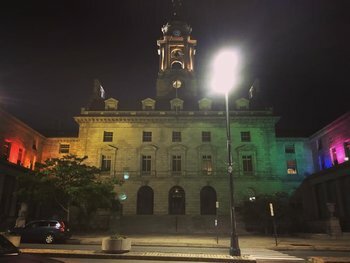 City Hall in Portland, Maine. Our hearts are filled with sorrow and love for the LGBT+ community in Orlando. June is the month of Pride, and we encourage all who can to get out—see the parade, volunteer, be with your friends and family—and show your support and solidarity with Orlando. Pride Portland has events going on all this week, leading up to the parade and festival this Saturday. Details here: www.prideportland.org. LT Staffers are keeping their eyes peeled for local memorial events, like vigils in Portland and Boston, and other ways to help. Give blood. Our local blood donation centers are here: Portland and Boston. The Red Cross and Oneblood are both great ways to find donation centers and blood drives in your area. If you donate blood and tell us about it, you can have a lifetime LibraryThing membership, on us. Just send us an email. Donate money. There’s a dedicated fund for Orlando victims set up by Florida’s LGBT Civil Rights organization here: https://www.gofundme.com/pulsevictimsfund. If you’d like to donate locally, we recommend for PFLAG (Boston) and Outright (Portland, Maine). Both organizations have branches around the country, as well. Read up. Representation in books and other media is just one part of the ongoing struggle for LGBT+ folks. Come check out two relevant LT lists, Best LGBT Fiction and Good LGBT Fiction for LGBT Folk and Friends, to add or pick up suggestions. If you have any other ideas on ways to help, or thoughts you’d like to share, join us on Talk, or let us know in the comments. As many of you know, the American Library Association’s Annual Conference is happening later this month in Orlando. If you’re attending, we highly recommend checking out their page on Orlando Support Activities. Further recommended reading: this statement from the chair of the Gay, Lesbian, Bisexual, Transgender Round Table at ALA.
P.S. In honor of Orlando and Pride, we’ve updated our Twitter and Facebook logos. The 2nd annual LibraryThing Holiday Card Exchange is here! Inspired by the “ALA Think Tank” and Reddit, last year was a huge success so we’re doing it again! You’ll get one from another member. Only that member will see your address. Sign-up closes Thursday, December 17 at 1:00 PM Eastern. We’ll inform you of your matches within an hour or so. Send your cards out soon after. Questions? Join the discussion on Talk. We’re pleased to announce that the ninth annual SantaThing is here at last! What’s SantaThing? SantaThing is Secret Santa for LibraryThing members. » Sign up for SantaThing! You pay into the SantaThing system (choose from $15–$50). You play Santa to a LibraryThing member we pick for you, by selecting books for them. Another Santa does the same for you, in secret. LibraryThing does the ordering, and you get the joy of giving AND receiving books! Sign up once or thrice, for yourself or someone else. If you sign up for someone without a LibraryThing account, make sure to mention what kinds of books they like, so their Santa can choose wisely. Sign-ups close MONDAY, December 7th at 5pm Eastern. By Tuesday morning, we’ll notify you via profile comment who your Santee is, and you can start picking books. Picking closes FRIDAY, December 11th at 5pm Eastern. As soon as the picking ends, the ordering begins, and we’ll get all the books out to you as soon as we can. » Go sign up to become a Secret Santa now! Every year we tweak SantaThing a little. This year we’re happy to have Portland’s own Sherman’s Books & Stationery as our official local SantaThing store, Powell’s, Book Depository, iBooks, and Amazon (including national ones) as our booksellers. You can choose to have your books picked and sent from any of these stores at any and all price points. Just like last year, the Kindle Only option is available to all members, regardless of location. So long as your Kindle is registered on Amazon.com (not .co.uk, .ca, etc. ), you can elect to receive your SantaThing gifts as Kindle ebooks. See more information about Kindle and SantaThing here. Every year, LT members give generously to each other through SantaThing. If you’d like to donate an entry, or want to participate, but it’s just not in the budget this year, be sure to check out our Donations Thread. Some of our booksellers are able to offer free shipping, and some are not. Depending on your bookseller of choice, you may receive $5 less in books, to cover shipping costs. You can find details about shipping costs and holiday ordering deadlines for each of our booksellers here on the SantaThing Help page. See the SantaThing Help page further details and FAQ. Feel free to ask your questions over on this Talk topic. As always, you’re welcome to email us at info@librarything.com or you can reach Loranne directly at loranne@librarything.com. Thanks to Marvin Getman, who produces the show every year, LibraryThing members can attend the Boston Book, Print and Ephemera Show for free this year! The show is happening Saturday, November 16, from 8am-4pm at the Back Bay Events Center. That’s the same weekend as the Annual Boston International Antiquarian Book Fair (hosted by the Antiquarian Booksellers’ Association of America). How do I get my tickets? Print them here. Questions? Comments? Send them to info@librarything.com. 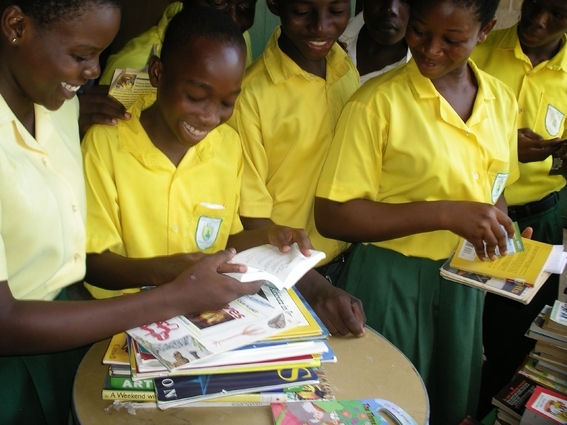 Books for Ghana: LibraryThing teams up with Books Matter! Between November and April, LibraryThing members raised nearly $2,600 for needy readers by adding events to LibraryThing Local! When we announced this initiative we asked for your help in coming up with the best way to use this money to put books directly into the hands of readers who would benefit the most from them. We wanted to find a project where our contributions can really make an immediate, tangible difference, and one with which LibraryThing and its members can build an active and ongoing relationship. We’re very pleased to announce that we’ve found just such a project! In February we donated donated $600 of the funds raised to Keith Goddard’s Books4Ghana campaign on IndieGogo, enough to put that effort over the top. Keith, who’s been a public school teacher in Toronto for the past fifteen years and has family connections in Ghana, began collecting books last summer for the Bright Future School in Keta, Ghana, a K-9 school with 600 students and thirty faculty members. The first batch of 200 math textbooks and 500 children’s books were sent in August 2012, and arrived in October. Another 3,100 books Keith collected from schools around Toronto (and stored in his house!) were shipped this February after the successful IndieGoGo campaign, and arrived just a couple weeks ago. They will be delivered to the school later this month. You can browse the catalog of these books at http://www.librarything.com/profile/booksmatter. As the project expands and books arrive at additional libraries, we’ll be separating these out into separate LT catalogs for each library, so that they can be optimized to fit the specific needs of each school (and so that they can be updated as needed, of course). Keith has now launched a new website for the Books Matter project at http://www.booksmatter.org, and is in the process of registering as an official charity. He’s currently rounding up the next batch of books to ship over to Ghana, and identifying the schools there that will benefit most from books we send. 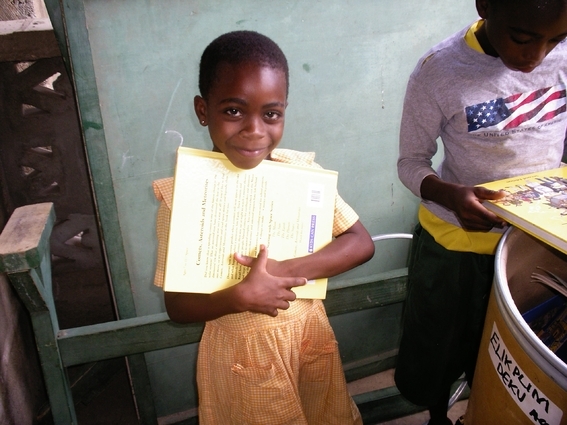 Right now the major need is funding for shipping already-donated books to Ghana: payment for a shipping container, sea transport to Accra, Ghana, and then transportation from Accra to the schools in the Volta region). It costs approximately $1 per book to pay for shipping (as Keith says, “$10 sends 10 books, $50 sends 50 books: the math is simple, but the effect is profound”). We’re going to be giving more of the money members raised by adding events to LT Local for this, and we invite you, should you feel so inclined, to head over to Books Matter and donate directly to the cause as well. If you donate, make sure to mention you’re a LibraryThing member! This is about more than money. Books Matter is cataloging everything they send to Ghana. Having everything cataloged allows us to do more than send random books. We can get involved in collection development—sending the right books to the right schools to fill gaps or to focus on areas of interest. We can do this site-wide or in groups. So, for example, wouldn’t it be cool if the “Green Dragon” and “Science!” groups could collaborate to make sure they’ve got a good collection in their area? And teachers and children at the schools can also participate, telling us what they need and how we can help! That’s our idea. We’ll support it with some money and with features. But members will have to drive it. Let’s see what we can all do for readers in another country. We’ve wanted to do something like this for a long time. We feel it’s important to give back when we can, and we want to give our members an easy way to contribute to a worthy project that puts books in the hands of readers who need them. By working with Keith and Books Matter, we’re in on the ground floor of a new, exciting project with lots of growth potential, and will be able to work with him to make sure that our contributions get where they need to go. We’re really delighted about this, and we hope you all will be too! We’re very excited to announce a whole series of improvements to LibraryThing Local, your gateway to tens of thousands of bookstores, libraries, book festivals, author readings and other bookish venues and events. Speed. As the data grew, Local got slow, especially if you lived somewhere like New York. The html pages for places like that were also gigantic. (And I mean gigantic. They crashed browsers!) New Local is much faster, with page-load times of a few seconds at most, and pages under 100k. Better, bigger maps. You can now zoom, click and drag the maps and new venues will come in dynamically. (Before they just stopped outside the sample area.) Each map also has a full page mode (see New York, NY) that fills the page. More venues! More events! Our recent push for events produced a huge influx of new venues and events. We also wrote special scrapers for most of the major publishers, and B&N and IndieBound stores, which more-than-doubled what users entered. We’re up to 80,500 venues, including 28,000 bookstores and 45,000 libraries, and 118,000 bookish events, including nearly 10,000 upcoming. 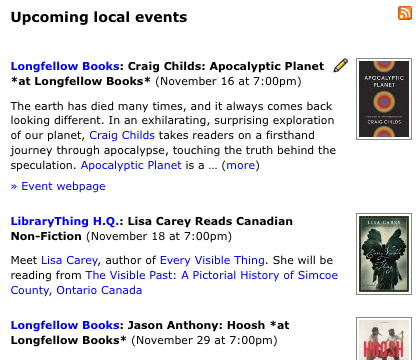 All-in-all, we’re confident that no other source has as much information on bookish events as LibraryThing Local. Books for Ghana. We’re also extremely pleased that by adding events to LT Local, members raised more than $1,700 for needy readers. So far we’ve contributed $600 of that to Keith Goddard’s Books4Ghana campaign on Indiegogo, putting that effort over the top. This will fund the shipping of several thousand books to the Bright Future School in Keta, Ghana this spring. We hope to work with Keith more going forward. New version of Readar. We’ve updated Readar (formerly Local Books) to make it compatible with the 5S. If you haven’t used it yet, Readar is a simple app for bookstores, libraries and bookish events near you. I use it all the time at home—every time I want to call a bookstore, they’re all right there. And I use it whenever I go on a trip, so I know where to spend my free time. Local Members. The Local members page, which shows members near you who’ve chosen to make their location public, has been thoroughly revamped and updated, with a pleasant checkerboard view. It’s on “infinite scroll,” so that it loads ahead of you, like Pinterest. The members are sorted semi-randomly, with members who are more active on LibraryThing or share something with you nearer the top. To add a public location, or remove yours, edit your profile. As of now, only about 27% of members have public locations. You also have a “private location,” so you can find out what’s going on in your town without telling anyone where that is! Profile page changes. Just some slight tweaking on your profile page: we’ve moved the “About me” and “About my library” sections up a bit, so they now appear before your lists of groups and favorite authors and venues. We’ve added a “Favorite venues” link directly to your LT Local Favorites page. Event filtering. Back in November we added a way for members to filter out events they didn’t have any interest in seeing. We’ve expanded that to filter out some less “pertinent” events—mostly all the Nook demos at B&N stores—at a global level, so they won’t show unless you want them to. You can toggle to seeing absolutely everything by choosing “all” instead of “most” above event lists. Talk about it. Come talk about the changes here! If you find a bug, tell us here. 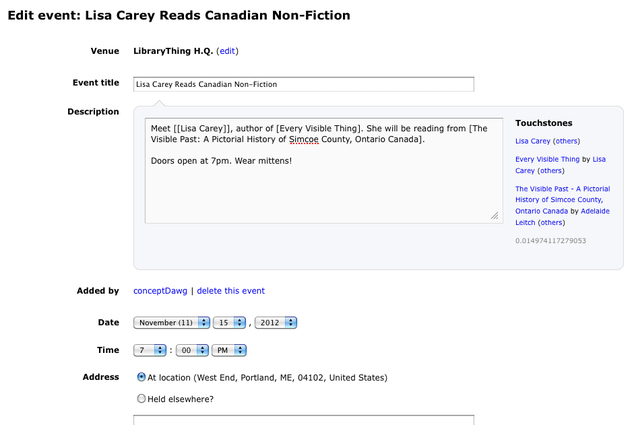 Add events to LibraryThing Local, Give books to needy readers! For every bookstore and library event added to LibraryThing Local from now until January 1 April 4, 2013, LibraryThing will donate up to 15 cents to put books in the hands of the needy. Adding events is easier than ever. To add events go to LibraryThing Local and choose “Add event” there or under a specific venue (bookstore or library). In addition to manually entering events, programmers can also use our new Add Events API (also see blog post) to add events by the hundreds. Go ahead, cost us millions. We’re only going to count events added to real-world bookstores and libraries, and the events must be future events, not past ones. Events can be in any country. What happens after January 1 April 4? We don’t know. If it’s a success, we’ll probably keep doing this. Buy India a Library, which, builds and staffs a library in a poor part of India (see my friend Andromeda Yelton’s YouTube video about it, another friend, Justin Hoenke is also involved). One Library at a Time, responsible for creating two libraries in Panama and starting another in Ghana. There must be many more. I’m also interested in South Sudan, where LibraryThing member johnthefireman works. Come discuss where we should spend the money on Talk here. Why we’re doing this. LibraryThing Local has been a success, but mostly as a way for members to mark and broadcast their favorite bookstores and libraries. LibraryThing Local Events originally included some automatically-added events, especially a full event feed from Booksense/IndieBound, but IndieBound eventually decided to stop providing event feeds to sites like LibraryThing after booksellers complained that their events were being, yes, listed on the web. (Really.) Meanwhile, automatic feeds from some other sources foundered on the lack of a good way for members to filter out low-interest events, such as daily storytimes. All-in-all, events have suffered. The fewer events showed up, the less attractive the events system seemed. LibraryThing members continue to curate and improve the system constantly (with over 4.6 million edits to Common Knowledge, 3.4 million work combinations and separations, etc. ), but events have lagged behind. Meanwhile, LibraryThing has become a profitable company (clap, clap, clap). We’re not wildly profitable, and are spending most of our money on hiring new people, but I feel it’s important to give something back the moment we can do so. Staff and members have long wanted to help build a library in a poor country, or for a disadvantaged population. As someone said, “what you can do, you should do.” We can do this. But if we’re going to do it, why not get members involved–improving the site for all and “buying into” the charitable project? The Fine Print. Events added to LibraryThing Local, whether manually or using the Add Events API must be connected to a unique LibraryThing account and conform to the the LibraryThing Terms of Service. The addition of spurious, spam or any other non-events is not permitted, will not count and may result in the suspension of your LibraryThing account. If event quality suffers, we may have to adjust what qualifies. What events qualify is up to our sole and final discretion. LibraryThing shall determine how the money will be spent, when and where. We are setting an initial, optional limit of $1,000 per member and $5,000 overall, just in case someone figures out how to add 500,000 events we didn’t know existed. We reserve the right to modify the fine print at any time, and to cancel the program as well. We are giving ourselves legal leeway here. We want no basis for getting sued. But if we scrooge this up, you are encouraged to excoriate us for it everywhere you can. Come discuss the feature in general here. Image of coins courtesy Flickr user freefotouk (Ian Britton). “Is There a ‘Real’ Maine?” – Book Discussion in Portland! If you’re in or around LibraryThing’s home base in Portland, Maine, we hope you’ll join LibraryThing, the Maine Humanities Council, and the Portland Public Library for a discussion exploring the portrayal of Maine in children’s literature: “Is There a ‘Real’ Maine?” We’ll use Robert McCloskey’s classic One Morning in Maine as a case study and starting point for the discussion. Details: Wednesday, March 28, 6-7 p.m., at the Portland Public Library. No RSVP is required, but you can “Join” the event on the MHC’s Facebook page. We hope to see you there! And don’t forget the Maine Festival of the Book, which starts the next evening and runs through Saturday, April 1! Tim and I will be at Arisia 2011 in Boston this weekend: at 6:30 p.m. on Saturday Tim will offer an introduction to LT , and I’ll be talking to publishers about our Early Reviewers and LibraryThing for Publishers programs. If you’re there too, make sure to come say hi!